[Image: A mobile, military field hospital and medical instant city]. If you happen to be in Montreal this week, I will be giving a lecture tomorrow night at the Canadian Centre for Architecture. I have to admit to being a long-time fan of the CCA, so it's quite a thrill to be speaking there. The lecture is free and open to the public, it's on Thursday, October 22, and it kicks off at 7pm; it's called "Cities of the CDC." For the most part, I'll be addressing the topics of urban form, epidemic disease, and the spatialization of public health, by way of my recent research into spaces of quarantine. The point is to look at a number of questions, including: What might have happened, architecturally speaking, if Archigram, when it came time to design their Instant Cities, had teamed up with the CDC? 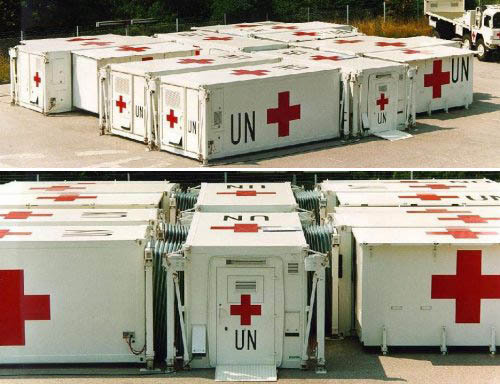 [Image: A modular, "containerized" field hospital complex by the Red Cross and UN]. Put another way, what might have been the result if the CDC had been asked to design a planned city like Masdar, and not Norman Foster? Is there such a thing as a medical utopia? And how do our cities help to shape the diseases that infect us? Along with this will be some new, previously unpublished material taken from the ongoing series of quarantine interviews that I've been doing with Edible Geography. In any case, if you're in Montreal tomorrow night, be sure to say hello! This sounds amazing and I really wish I could see the talk.